The holidays are over, and holiday camp is out, but school was not yet in. So today’s theme was a “bring your child to work day” thing. B.T. was a trooper sitting in the empty cube next to me most of the day. 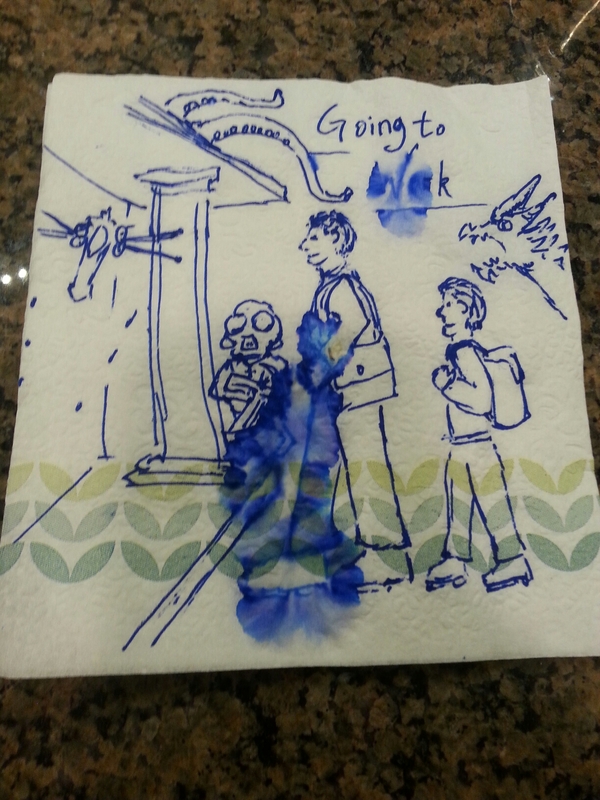 Here’s a shot of what today’s napkin looked like after a little use. I’m terrible at people in ink. Pencil had always been my preferred medium for art. Even then, faces and bodies take me considerable more effort to prefect. But yes, that is supposed to be myself and my eager young space cadet going in to work. In reality, I realized post hoc that B.T. is still quite a but shorter than that. He comes not to my shoulder but just past my waist. In parting, I leave to the reader’s imagination what the various oddments found here at my place of labor represent.